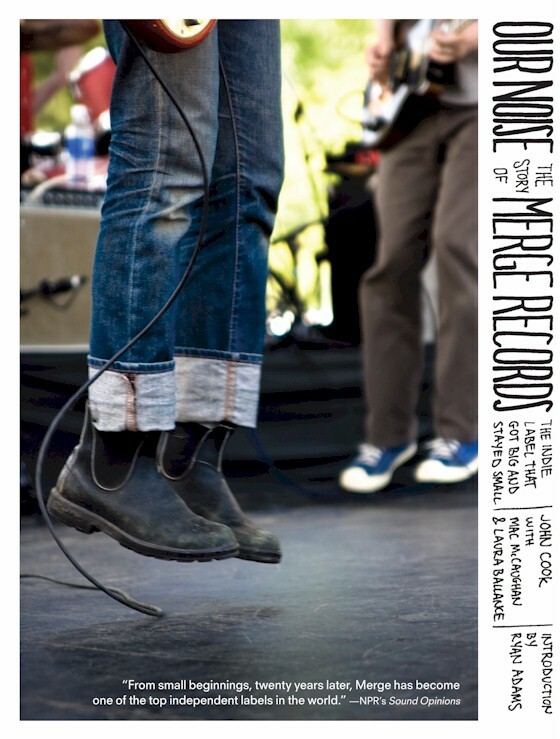 Today TWM goes book club with a chat-review of Our Noise: The Story Of MERGE Records. Terri and I sat down and chatted about the book that chronicles the infamous record labels history from its independent DIY seven-inch roots to becoming one of the most popular and respected labels in indie-rock history. The book is also sectioned off into chapters about specific MERGE artists, from label owners Mac & Laura’s band Superchunk, to Neutral Milk Hotel, Spoon, and lesser known bands like Butterglory and Lambchop. Just one glance at the list of records MERGE has put out and you’ll understand exactly what we’re talking about when we say legendary. So let’s get on with it! Terri Coles: So, that was a quick read, huh? Dan Gorman: Totally, I think it also helped that they packed it full of interesting Merge photos and artifacts. Also the book is presented from interviews which give it a pretty breezy-tone and make it easy to plow through. It was nice to see visuals of the bands, since I don’t necessarily know much about some of them. Or didn’t going in. Dan: I wasn’t super familiar with Merge going in either. I had recently become completely obsessed with Superchunk which is what lead me to the book. But the photos helped guide through those sections on bands I maybe didn’t know about, yeah. Terri: What was your favourite chapter? Dan: Hmm.. Well as I mentioned Superchunk kind of frame the story, so all of that I found really engrossing. Charting their rise and also the creation of the label and such. The Spoon chapter was a major stand out as well, but I also was surprised how much I liked the Arcade Fire chapter seeing as I’m not a fan of the band. Terri: I figured I’d like Spoon’s best because I love the band, and I did enjoy it. But I think it’s a tie between the Magnetic Fields and Neutral Milk Hotel. Because they each had records that were really important, and I didn’t know much about how they came about. Dan: The Magnetic Fields chapter was definitely interesting, they’re another band I don’t really listen to. I should probably go get 69 Love Songs… ha. There was some cool facts about the band in that chapter. Terri: And Merritt just seems like such an odd, but interesting, guy. And I’d had no idea that Aeroplane was inspired by Anne Frank and her diary. Dan: I think I remembered hearing it mentioned, but the chapter on NMH really made me realize how heavily it was inspired by Anne Frank, yeah. Terri: Yeah, knowing that about the album adds a whole new layer to it. Dan: I also liked that even though Jeff Mangum didn’t contribute much, at least got to say his piece at the end of the chapter and lay out how he feels about Merge etc. Terri: Were there any parts you weren’t as into? Dan: The only thing I didn’t love was Ryan Adams’ intro, I thought it was an admirable effort but it was a little bit… pretentious? Something rubbed me the wrong way about it. It was very Ryan Adams, but I didn’t feel like it really gave me much information on what was coming up. Dan: Not terrible in anyway, just a little bit ‘much’, that’s for sure. Terri: Some of the stuff about Mac and Laura’s relationship was a bit much for me. Terri: It felt like I was finding out stuff I didn’t really need to know. I get why it was included, but it made me squirmy. Dan: I can see that, It was kind of that moment in the bands life where I think at the time people didn’t know what was going to happen to them. The whole album Foolish definitely has that squirm to it, total break up album. Good for Merge that they didn’t disband though. The book overall just made me want to start a record label! Terri: I know, me toooo. I think they were smart because they started really small, and just grew with it naturally. They didn’t try to run out and have their Arcade Fire immediately. Dan: And they are really adamant that they sign artists they love and want to work with, not looking for a cash cow or whatever. Which I can get behind. Terri: Yeah, it seemed like they got taken by surprise by Arcade Fire and Funeral. And Spoon’s success built over the course of a few albums. Dan: I guess Arcade Fire was their first album to really blow up so fast, they had to scramble to get more copies made after Pitchfork gave it that really hyped review, yeah. Terri: It’s cool to see that happen to a label that just kept doing what they wanted to do. Dan: Yeah, all in all it’s a really nice success story. It’s awesome to see one where finally the good (and in the beginning, little) guys win. Would you recommend it to people reading TWM? It’s a cool way to see inside how an indie label runs. And they’ve released so many great albums. So yeah, recommended from me too. Terri: We always read interviews with the artists; cool to learn so much about the people behind them.